Here comes the next entry in our limited series of posts leading up to the STOICON 2016 conference, scheduled in New York City for 15 October. (More info? Here. Tickets? Here. Looking for cheap accommodation with a fellow Stoic? Here.) The idea is to briefly feature each of the scheduled speakers for our talks and workshops so that people can better appreciate some of the leading figures behind the Modern Stoicism movement (is that what it is? ), as well as give their reasoned assent to the impression that this is a conference well worth attending. 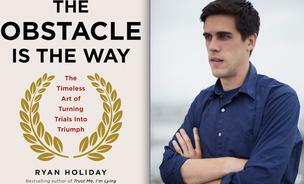 Today’s short profile is of our keynote speaker, best-selling author Ryan Holiday, author of The Obstacle Is The Way: The Timeless Art of Turning Trials into Triumph. Ryan is a media strategist and prominent writer on strategy and business — yeah, petty far from an academic philosopher, we like to mix things up that way. After dropping out of college at nineteen he went on to advise many bestselling authors and multiplatinum musicians. He served as director of marketing at American Apparel for many years, where his campaigns have been used as case studies by Twitter, YouTube, and Google and written about in AdAge, the New York Times, and Fast Company. His first book, Trust Me I’m Lying — which the Financial Times called an “astonishing, disturbing book” — was a debut bestseller and is taught in colleges around the world. He is the author of two other books and is now published in 16 languages. He currently lives in Austin, Texas with his rebellious puppy, Hanno and pet goats. Over at his blog he talks about the kind of things that he wishes blogs would talk about more often: life, dealing with assholes, how to be self-critical and self-aware, humility, philosophy, reading and strategy. And by those things he means those things in a thoughtful and practical way, not SEO-bait and bulleted list stuff. At STOICON Ryan will give the closing talk in the late afternoon. Drawing on a singular passage from Marcus Aurelius (“The impediment to action advances action. What stands in the way becomes the way”), Ryan will speak about the Stoic art of turning obstacle upside down. He will provide his insight into the success of some icons of history — from John D. Rockefeller to Amelia Earhart to Ulysses S. Grant to Steve Jobs — the use of an approach that let them turn obstacles into opportunities. Faced with difficult situations, they found their way to astounding success. Some of these figures had studied Stoic philosophy as young men or women — others understood it only intuitively. In any case, Ryan suggests, they were not exceptionally brilliant, lucky, or gifted. Their accomplishments came from the application of timeless philosophical principles that aim at excellence in any and all situations. He’ll also talk about how he came to Stoic philosophy and how he’s tried to apply it in his own life, in his writing and in his career in business. This entry was posted in STOICON & Stoic Week on June 27, 2016 by Massimo. But how do I shake my belief that he is a douche? Or do I have to? My opinion stems from reading his various interviews, Reddit AMAs, and Reddit correspondences where he conflates various Stoic topics with other awe-inspiring and uplifting messages that have no connection. It makes me feel that he is doing a lot of this as attention seeking without substance. Many of his points seem profound on the surface but when one examines them carefully are vacuous. When I challenged him once on Reddit, he responded with an ad hominem attack. I don’t know Ryan, and I do agree that the general sound is more self-help / businessy than philosophically Stoic. That said, Ryan was suggested by Jules Evans, the organizer of the previous two STOICON events in London, and I trust Jules very much. Thanks guys–this is very nice. I’m definitely not a human being who would see these comments, just a douche happy to be half-heartedly vouched for for a conference I was invited to speak at and then was asked to help promote. Looking forward to meeting you both. Hope we can get along better in person. Just saw your comment on the blog. I can assure you that your invitation was not half hearted, it was made at the behest of Jules Evans, who spoke very highly of you, and the organizing committee endorsed it without reservation. As for the self-help / business aspect of your writing, I don’t think it’s a problem, though some people obviously do. As you say, attendees will have an opportunity to meet you in person and ask questions, and I look forward to it myself. Stoicon sounds great, in a word. As someone who’s only loosely familiar with its precepts and teachings (I’ve tried to follow this blog but lamentably failed, thanks to a life of information overflow), do you think it would be suitable? I’ve read (or rather listened to) Marcus Aurelius’s meditations and Seneca’s letters, and have had some introductions to Stoicism as part of wider philosophy/ethics courses, but that’s about it. I presume you’ll be there too (giving a talk perhaps)? Absolutely, there will be talks at various levels, including a workshop of intro to Stoicism run by yours truly.